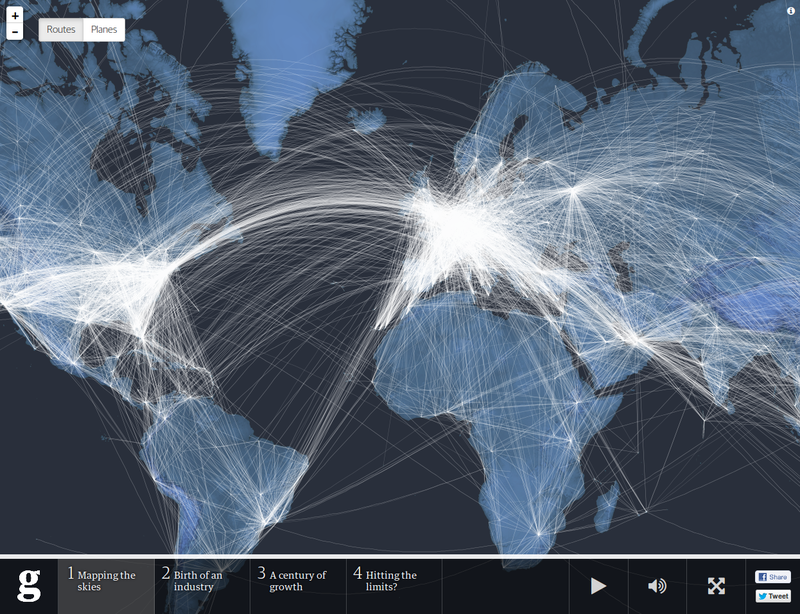 ⚡ See how connected the world really is — a cool little interactive page showing every flight in the sky worldwide in a 24-hour period. A cool little interactive page put together by The Guardian in 2014. It shows every flight in the sky worldwide in a 24-hour period — you can either watch as it scrolls through automatically or skip manually to different times of day. The picture that it creates is pretty amazing — the world covered in hundreds of tiny dots, with huge clumps of dots over Europe, North America and East Asia. You can zoom in on specific area or switch to a map showing every route in the 24-hour period. There’s also a set of video clips on the history of flight and what the future holds — although air travel has rapidly increased in popularity in recent years, it can only be sustained for so long. The videos only briefly touches on climate change — if you want to know more, Heat by George Monbiot is a good starter.